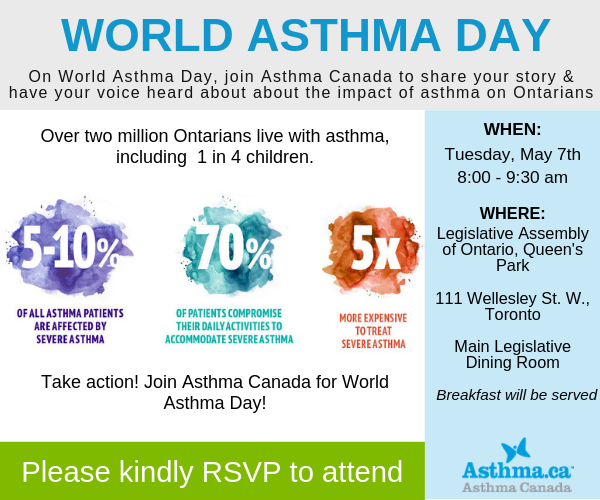 Join Asthma Canada for a breakfast reception at Queen’s Park to raise awareness about asthma and Severe Asthma. Over two million Ontarians live with asthma, including 1 in 4 children. 5 – 10% of people with asthma are affected by Severe Asthma. Severe Asthma is a life-threatening condition that can affect people’s entire life by forcing them to make unwanted changes to their daily activities. Those who have Severe Asthma experience frequent and severe worsening of asthma symptoms (asthma attacks/flare-ups) despite taking multiple high-dose inhalers. These attacks or flare-ups often occur more than once per year and require steroid tablets or use of emergency services or hospitalization. Despite the severity of the condition, it is often misdiagnosed, and patients with Severe Asthma often do not receive the care they need and deserve. We invite our community to join us in solidarity to get the conversation of asthma on the provincial stage. On World Asthma Day, take action and have your voice heard! Please note, you must RSVP to attend this event.